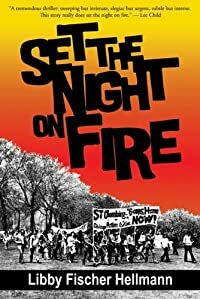 Set the Night on Fire by Libby Fischer Hellmann, a Mysterious Review. Review: After her father and twin brother are killed in what seems to be an accidental house fire in Chicago — a blaze she just missed being in herself, while in town visiting for the Christmas holidays — Lila Hilliard just wants to put the immediate past behind her and return to her life in New York City. But someone clearly has his mind set on killing her, too, in Set the Night on Fire, a stand-alone thriller by Libby Fischer Hellmann. Lila thinks at first she's simply the victim of a random attempted hit-and-run when a motorcycle tries to run her down. Fortunately, a man is walking down the street at the same time and saves her from serious injury. He runs off before she can get his name and thank him. But when a grenade is thrown into the apartment where she's staying, and that very same man once again saves her from being killed, she realizes someone is trying to kill her — and someone else is trying to protect her — but for what reason she cannot imagine. An old photograph among her father's possessions, and an strangely encrypted online image, lead her to believe the answer to the mystery — and identity of her attacker — may be in the past, in the late 1960s, at a time when her father was part of the anti-war movement in Chicago. The plot of Set the Night on Fire sets up nicely. The unknown elements from the past, from the people Lila meets to the items she finds among her father's effects, add to the overall intrigue of the story. The twist at the end — if, indeed, that is what it is intended to be — is foreshadowed far too early for it to be effective surprise. Still, the engaging and well-drawn characters and the fast-paced, driven plot keep the reader's attention. What almost derails said attention, though, is a lengthy trek back in time. About midway through, the author inserts some 130 or so pages of backstory. It's not clear what the purpose of this is since most of, if not all, the relevant information presented here is provided in a more contextual manner in the pre- and post-backstory parts of the book. The backstory is interesting on its own, but altogether seems redundant and thus unnecessary. Acknowledgment: Allium Press provided an ARC of Set the Night on Fire for this review.